We keep hearing that an apple a day keeps the doctor away. But now an apple for days can you’re your weight away. Apples are known to be very rich in minerals, vitamins and fibers. And what makes it a wonderful fruit is that it contains very few calories, approximately 80-100 but it depends upon the size of the fruit. Due to the above properties, apple is an ideal fruit for weight-loss. Whenever you eat an apple, the high fiber content in it makes you feel full and stuffed. Consuming one full apple makes you feel that now you cannot eat anything else because you have had a heavy meal. Hence, you end up eating less and feeling full. Apples also contain some enzymes that help in proper and efficient digestion of food. 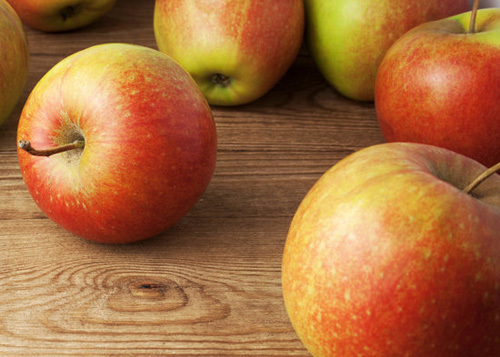 Apples contain a component called ursolic acid, which lowers down the risk of obesity as it boosts calorie burn. Apples are also beneficial for the nervous system. All the above mentioned benefits make apple an ideal fruit to reduce weight without losing your glow or charm. Keeping this in mind, we have compiled a 5 day weight loss diet plan. An apple a day keeps the doctor away…Below is the 5 day Apple diet routine which everybody is advised to follow to stay healthy and avoid obesity. On Day 1, you should consume about 1.5 kilograms of apple. For this, you have to eat just apples in your breakfast, lunch and dinner. Though it is a bit difficult but not impossible. Breakfast: Consume reasonable quantity of apples in breakfast and nothing else. Lunch: You are surely allowed to have other things as well along with apple. You might have an apple, 2 carrots, some green salad and a quarter of onion. Since eating that much of onion might cause bad breath, you may chew few mint leaves after the lunch. Dinner: You are allowed to eat only apples in dinner as it is a perfect light meal for night. Breakfast: Your breakfast should contain an apple, one slice of wholegrain bread and a piece of turkey or chicken bacon. Lunch: In lunch, consume what you consumed in lunch on day 2, i.e. an apple, two carrots, green salad and a quarter of onion. Again, you are allowed to chew mint to avoid bad breath. Dinner: Like lunch, dinner is also just the same as on day 2. Have only apples in moderate amount. Tend not to worry as you just have to be patient for 2 more days. Breakfast: An apple, a piece of wholegrain bread and a slice of low calorie bacon would be ideal to start off Day 4. Lunch: Your lunch is supposed to contain an apple, a delicious vegetable salad and 200 grams of skinned chicken or roast beef. Remember to chew slowly to give an indication to the body that you have had sufficient. Dinner: In dinner, as usual, eat only apples to have a light meal. Remember to eat in moderate quantity. So here we are on the last day of our diet routine. Breakfast: Have an apple, a boiled egg and one slice of wholegrain bread in morning. Lunch: For lunch, do consume an apple, a vegetable salad or moderately spiced boiled vegetables and 200 grams of skinned chicken or roast beef. Just a meal away to complete this 5 day course…! Dinner: To end the last day of diet plan, eat apples in dinner.